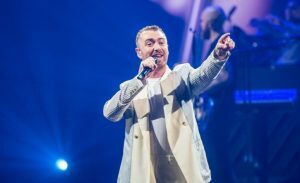 Macau (Macao SAR) – October 24, 2018 (travelindex.com) – Sam Smith performed two powerfully soulful, yet incredibly uplifting concerts in Macau inside the MGM Theater of MGM Cotai on Friday and Saturday nights. His blend of heartbreaking ballads and upbeat songs resonated with concert-goers who enjoyed an up-close and personal experience with Smith inside Asia’s first dynamic theater. His moving performance surpassed all expectations with The Thrill of it All. Smith sang his hugely popular hits: “I’m Not the Only One”; “Too Good at Goodbyes”; “Lay Me Down”; his Grammy Award-winning song, “Stay With Me”; an acoustic version of “Latch”; the James Bond Spectre theme song “Writing’s on the Wall”; “Restart” and “I Sing Because I’m Happy”. He also performed a number of recent, uplifting songs such as “Omen” and “Promises” which were very well-received. Smith came to Macau as part of The Thrill of it All tour to nine cities all across Asia. Since the release of The Thrill of it All in November last year, it hit the top of the UK Albums Chart and the US Billboard 200. The album’s lead single, Too Good at Goodbyes, reached number one in the UK and Australia, and became Smith’s sixth UK number one single. In October 2012, Smith catapulted to fame when he was featured on Disclosure’s single, “Latch”. Two years later, he released his debut studio album, In the Lonely Hour, featuring “Stay with Me” which went on to become an international sensation, reaching number one in the UK and number two on the US Billboard Hot 100. In 2015, Smith garnered many prestigious accolades, winning four Grammy Awards; a Golden Globe Award and an Academy award for the Spectre theme song, “Writing’s on the Wall”; two accolades from the 2015 Brit Awards and three award wins from the 2015 Billboard Music Awards. MGM Theater is Asia’s first dynamic theater designed by Scéno Plus, a leading performing arts and entertainment design firm. It is immersive, flexible and its agility allows the hosting of concerts, shows, corporate events and more. MGM Theater seats up to 2,000 people in more than 10 spectacular configurations. It is also the world’s first theater to feature a GALA revolving seating system in a 360-degree format surrounding stage. At a flick of a switch, this innovative seating system can be customized for the needs of any event, and within minutes, the theater can be transformed from an intimate dinner setting into a full-blown concert hall.